Blog: Will Insurance Cover My Eyelid Surgery? Sagging eyelids can have a significant impact on your appearance as well as your comfort. Both men and women are likely to develop ptosis of the eyes as they age because the surrounding skin and muscles become weakened. There are also instances where this ptosis is present due to a congenital disability or trauma to the eye. According to the American Society of Plastic Surgeons (ASPS), the average cost of eyelid surgery is $3,026. This price can fluctuate depending on geographic area, the skill of the surgeon, and other associated fees, such as local or general anesthesia. But can these costs be mitigated by going through your insurance. Most people run into the issue of not having their eyelid surgery covered by insurance. This is because it is considered a cosmetic procedure, and those procedures are not covered by insurance plans. The only exception to this rule is breast reconstruction following a mastectomy, which is protected by law. Routine anti-aging procedures, such as eyelid or brow lift surgery, are seen as cosmetic improvements only and cannot be paid for using medical insurance. This patient had weakness of both of her eyelids, worse on her right. 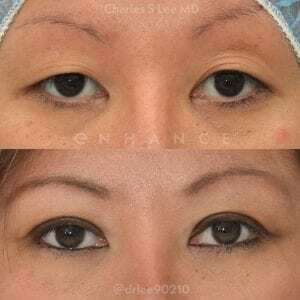 Both eyelid muscles were tightened (ptosis repair) and a crease placed. Note that the eyelashes no longer point downward and the vertical opening is greater than preoperatively. There are some cases where the ptosis of the eyelid can be classified as a medical issue. Eye ptosis in adults is caused by the levator muscles stretching and separating from the eyelid. If this issue becomes significant enough to obstruct your vision, then part of your surgery may be covered by insurance. To obtain coverage, your doctor will first need to evaluate your condition and determine if drooping lids are causing vision impairment. If this is the case, your doctor will submit their recommendation to your insurance company. In most cases, they will only approve the minimum treatment necessary to fix the medical issue. Cosmetic procedures, such as skin tightening, fat redistribution, or a brow lift, will likely be additional out-of-pocket costs. Should You Undergo Eyelid Surgery? If your eyelid ptosis is severely affecting your confidence and overall quality of life, you should schedule a consultation with a board-certified plastic surgeon to discuss your treatment options. Even if your surgery isn’t covered by insurance, there are financing options available through CareCredit® to help make your procedure more affordable. You can schedule your consultation at Enhance® Medical Center by calling (310) 231-6811.